Maharashtra Police Admit Card 2018: Maharashtra Police Department has recently released the Police Constable notification for 4500 above Constable posts. A large number of aspirants desirous to become the police constable have applied for the announced posts. The selection of candidates will be made based on various rounds written test, physical eligibility test, physical standards test, and medical examination rounds. Candidates applied for the constable posts have to appear for the written test in the scheduled date. All the applicants applied for the Maharashtra Police Constable posts must download Maha Constable admit card to proceed with the examination. As the hall ticket is the most important document, all the candidates are advised to download and preserve the hall tickets to appear for the test. Candidates will only be permitted to appear for the test after checking their hall tickets. Applicants can download Maharashtra Police Constable Admit Card 2018 from the Official website, mahapolice.gov.in. Maharashtra police bharti 2018 hall ticket :Maharashtra Police Department controls the safety and security of the state. The Maharashtra Police Department annually offers various job opportunities for the people having the suitable eligibility criteria. It recruits candidates based on their performance in various rounds such as PET, PST, Written Test, and Medical Test rounds. Candidates clearing all the rounds will be given posting. This year the department has announced 4500 plus posts for Constable posts for various locations across Maharashtra state. A huge number of aspirants interested to police in the state have applied for the announced posts. 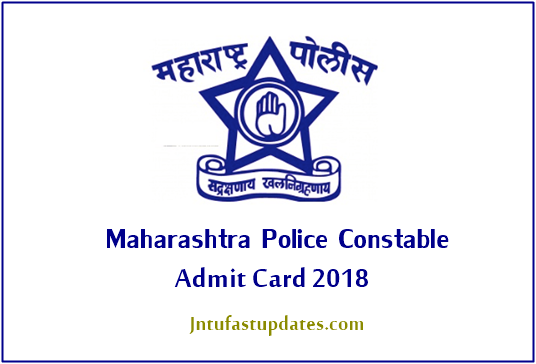 Candidates those have applied for the Maharashtra Police Constable posts can download MAHA Police Constable admit card 2018 before 2 weeks of the examination. Candidates can check the details of their examination center, date and time of examination from it. Candidates have to report at the exanimation center before 30 minutes of the examination. Also, carry any of the valid identity proof copy along with the hall ticket while going to the examination. After the verification of the identity of the candidate, he/she will be allowed to attempt the examination. Applicants can also check their details such as name, date of birth, hall ticket number, signature, photograph and other details from it. The Maharashtra State Police online application form last date closed on 28th February, 2018. So, the Examination cell will be conduct exam in the upcoming month. So the next event of Maha Police is to release the Maharashtra Police Admit Card 2018 to the candidates those who were applied to participate in the written examination. Candidates Should follow this website for Maharashtra Police Exam Date. We will update here once after official announcement. All of You please log in With Your id and go to the option download and select physical test hall ticket (1st option) then your police bharti hall ticket gets downloaded into your computer. Sir I have not yet received my hall ticket . Please reply Sir . I request you to do the needful. Maze hall ticket ajun aalele nahi.